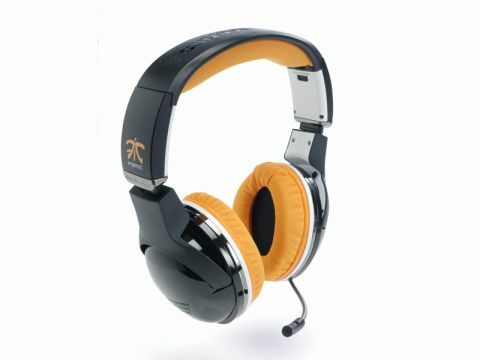 There's something of the 1940s bomber pilot look to the SteelSeries 7H Fnatic Edition headset, with its domed cups, retro orange padding and pull-out microphone. We'd certainly feel as comfortable walking down the high street with it on as we would sitting in the office or at home. It feels remarkably solid: the cord is thick and braided, and the orange earpads are interchangeable with black ones. Thanks to a clever design with metal contact points, the headband of can be detached, breaking the headset down into four separate pieces for easy transportation. The headphones do well in the gaming environment for which they're intended. Bass tones are rounded out nicely, while the mid-range and treble are clear and defined. Instead of boasting that these headphones are surround sound, Steelseries has opted for '3D positioning', which is designed as a more subtle surround effect to help with gaming in particular. They work equally well for music and movies, and the decent quality mic makes them more than adequate for Skype calls. Steelseries has made some weird design choices though. While the cable connects to you PC via the standard 3.5mm mic and headphone plugs, at the other end it connects to the headphones with a micro-USB plug. It sort of makes sense as it means the cable can be detached neatly, but we've had problems with micro-USB cables failing on some mobile phones. Steelseries' idea of head size seems to be a bit on the small side, and our review team's heads are a couple of inches bigger than average. This results in a snug fit with no sound leakage, but also means that prolonged use results in slightly sweaty ears. These quibbles can't detract from the appeal of the headphones though, and they're appealing both aurally and aesthetically.